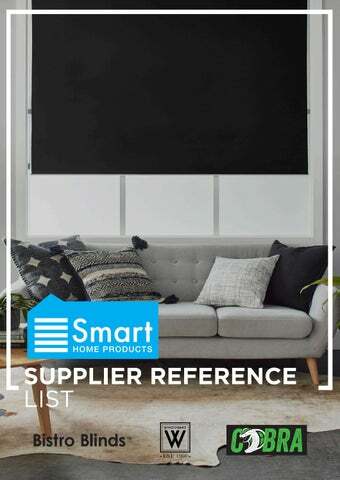 SMART HOME PRODUCTS ABOUT US Smart Home Products is an Australian family owned and operated supplier of Home Furnishing and Flooring products. The company distributes over 700 products under leading brands including Windoware, Bistro Blinds, Smart Flooring and Cobra. Our products are manufactured globally by leading industry partners with whom we share long standing relationships and have a mutual focus on quality. We are continually expanding into emerging categories, developing new products and introducing on-trend designs and finishes to complement your home. Smart Home Products has its own dedicated national field team to service and support the Bunnings network of stores. Customer measures their window and completes the relevant order form. Order forms are available in the aisle and can be downloaded from Home of Special Orders (HSO). Team Member checks that the order form is completed correctly: •	Ensure measurements have been completed in mm, and that these measurements are within the limits for the blind style selected •	Ensure all fields in the order form have been completed •	Ensure that all details on the order form are legible and easily understood Note: If the customer has made amendments to the measurements on the order form, please ask the customer to record the measurements on a new form. Order forms with crossed out and amended measurements cannot be processed. Use the supplier reference folder to identify the correct item numbers for the blinds. Note: Please ensure that the customer's measurements do not exceed the measurements outlined in the related field. Create a Customer order (COS) as per the normal process. •	Enter the Item Number identified •	Check for any extras identified in the customer order form and add appropriate item numbers if necessary •	Save the COS and record the COS number on the order form, along with your Bunnings store and Team Member details •	Provide the customer with the price for the blinds and explain the expected lead times to the customer. Note: Expected lead times for blinds are TBA working days from the time that the order is placed (and order form is sent to the supplier). Supplier will reconcile the Bunnings Purchase Order with the emailed order form, and manufacture blinds to the customer's specifications. Supplier will email the Special Orders desk to confirm that they have received all necessary information related to their order. When the blinds arrive it will have a clearly visible packaging insert showing the Bunnings COS number and the customer's name. Cross-check the COS order to ensure that all blinds have been received. When all blinds have arrived in store, contact the customer to let them know that their blinds are ready for collection. PURCHASE ORDER NUMBER By signing this document I am confirming that the stated measurements are correct. The order is final and once the blinds are cut to size no changes can be made. Joins two blinds together (adds NO width). Joins two blinds together (adds 10cm width). This cord clamp with adhesive backing is ideal for separating cords. This cord tie is simple to install with a convenient self-adhesive backing. TPR Rubber cable organisers with a self-adhesive backing. Double headed cable ties used to secure and separate cables into two groups. Easily identify electronic, audio visual and computer cables with the simple marker tab. This cable tie can be mounted for easy management by simply nailing or screwing into position. Featuring a reusable plastic container this tube contains an assortment of cable ties. Featuring a simple push and release tab, this cable tie will allow for use multiple times.